It’s once again time for Team A’s Sketch-y Friday reveal over on the ScrapMuch? blog. This week I’m featuring the Simple Stories Pumpkin Spice line again. I just love this collection! Ironically it’s also the manufacturer spotlight over at ScrapMuch? and Laura has created a ton of amazing pages and projects with this line. I swear I did this layout up before I found out it was the feature of the month. Clearly I have great taste in paper! Anyone else love pumpkin everything in the fall as much as I do? It’s always bittersweet for me because I love pumpkin but I hate that it means it’s the end of summer. 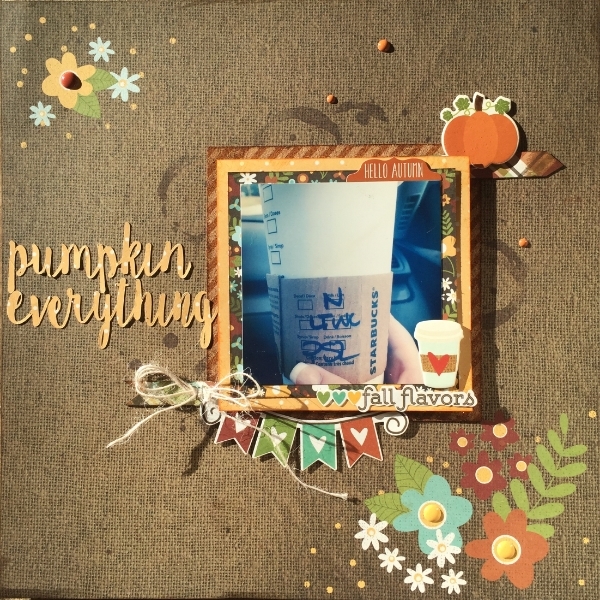 Pretty much everything for this layout was from the Pumpkin Spice line. I did use my Tim Holtz coffee cup stamp to ink up the base, fitting since it is a layout about coffee after all. I also used a piece of cork from a DCWV paper pad to add more texture, as well as some patterned lines to go with the dots and florals. I cut the title with my Silhouette. I glammed up the chipboard pumpkin with my clear Wink of Stella marker. The twine for the bow is American Crafts. Here is a run down of our Sketch-y Friday rules. Just link up your creations in our sidebar to be entered into a random draw for our monthly prize. You have until November 29th, at midnight to participate in any of this month’s sketch challenges, each linkup tool will remain open until that date! You may take some artistic license with your adaptation of the sketches, however if you choose to use a double page sketch for a single page layout you may only enter once per sketch, not once per side. Awesome layout Tiiu!!! I just love everything about fall….except the end of it! You captured fall perfectly in your layout! This is so deliciously full of fall! Love that background paper, and your little banner is too fun!